Lemon Balm is a native to southern Europe and northern Africa and has been cultivated for over 2000 years. It has a long history as a healing herb and was also part of a drink that ensured longevity. The branches were strewn on floors to freshen a room, as mentioned by Shakespeare in "The Merry Wives of Windsor".The Arabs introduced it as medicinal herb, a tea that was taken for anxiety and depression. Melissa tea is still known in France today as a remedy for fatigue and headaches. Melissa derives its name from the Greek for honeybee. The leaves were rubbed onto beehives to prevent swarming and to encourage the bees to return to the hives. The Greek physician Dioscorides wrote about it being used for scorpions stings and insect and dog bites. Lemon balm tea was known to have powers of longevity. Today the tea is taken to treat colds and flu, lower blood pressure and for insomnia and indigestion.Balm is an excellent carminative herb that relieves spasms in the digestive tract, and is used in cases of flatulent dyspepsia. Because of its mild anti-depressive properties, it is primarily indicated where there is dyspepsia associated with anxiety or depression, as the gently sedative oils relieve tension & stress reactions, thus acting to lighten depression. Primary chemical constituents of this herb include essential oil (citral, linalool, eugenol, citronellal, geraniol), tannins, bitter principle, resin, tannins, polyphenols, flavonoids, succinic acid, and rosmarinic acid. The volatile oils appear to act between the digestive tract and nervous system. It may be used effectively in conditions of migraine that are associated with tension, neuralgia, anxiety induced palpitations, and/or insomnia. Lemon balm has a tonic effect on the heart and circulatory system causing mild vasodilation of the peripheral vessels, thus lowering blood pressure. It can be used in feverish conditions such as influenza. Hot water extracts have anti-viral properties, possibly due in part to rosmarinic acid and other polyphenolics constituents. A lotion-based extract may be used for skin lesions of herpes simplex, the anti-viral activity having been confirmed in both laboratory and clinical trial. It also inhibits the receptor binding and biological activity of immunoglobulins in the blood of patients with Graves disease, a condition which results in hyperthyroidism. German studies show that the essential oil of Lemon Balm acts upon the part of the brain governing the autonomic nervous system and protect the cerbrum from excessive external stimuli. 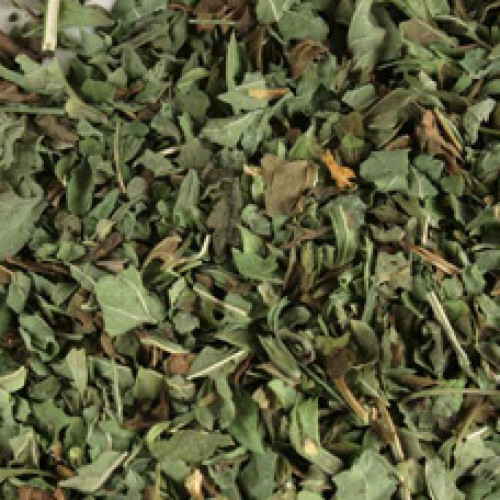 This is a safe herb for children, and it tastes very good.Fresh leaves can be used to sooth insect bites, and a linement made with lemon balm will help heal cold sores.